Hello easy dinner that tastes amazing. 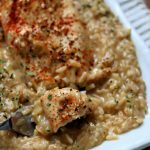 My kids and husband raved over this meal and I’ll admit I was pretty happy with the taste to work ratio. Some of my favorite recipes are those that start with frozen meat. I just love that I can throw frozen meat into the Instant Pot. It makes my procrastinator heart so very happy. If you have thawed chicken you can also use that…the pot will just take less time to come to pressure and you’ll get to enjoy your dinner a few minutes quicker. I wanted to cook whole chicken breasts and the pasta at the same time and in the same pot. The way that I did that was to cook the pasta using the pot-in-pot method. Using this method made it so the pasta wouldn’t overcook. I use either a fat daddios pan* or one of these stainless steel pans*. I lowered the pan straight on top of the chicken breasts. It seems weird but it really works well. The chicken turned out really tender and moist. I loved the Barilla cellentani pasta* that I used. The curly pasta is my favorite. 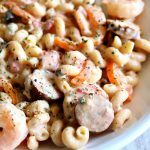 You can also use rotini pasta or cavatappi pasta as well. 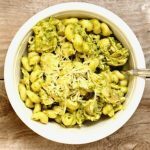 To make Easy Instant Pot Chicken Pesto Pasta I used my 6 quart Instant Pot Duo 60 7 in 1*. I love this Instant Pot because it has the yogurt making function which I use almost weekly. It has two pressure settings (high and low), and there are also little slots in the handles so that you can rest the lid there instead of putting it down on your counter-top. 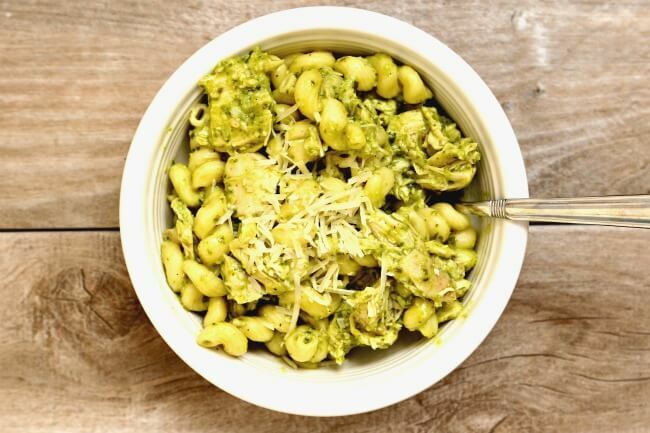 4 ingredient chicken and pasta with basil pesto sauce. 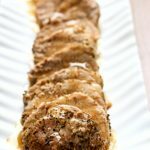 Start with frozen chicken breasts and a few minutes later you’ll have an amazing dinner in front of you. Pour chicken broth into the bottom of the Instant Pot. Place chicken in bottom of pot in a single layer. Salt and pepper the chicken lightly. Pour the uncooked pasta into a pan* that fits inside your Instant Pot (I used this one). Cover the pasta with water. About 3 1/2-4 cups of water worked for me. Carefully place the pan on top of the chicken. You can use a foil sling (or one made with a silicone baking mat) to lower the pan on top of chicken. Cover the pot and secure the lid. Make sure valve is set to sealing. Set the manual/pressure cook button to 10 minutes from thawed chicken or 12 minutes for frozen chicken. When the time is up let the pot sit there for 10-15 more minutes before moving the valve to venting. Remove the lid. Carefully, with hot pads, remove the pasta pan. Drain off excess water but save a quarter cup of the water to help the pesto stick to the pasta better. Discard the broth. Cut the chicken into pieces. 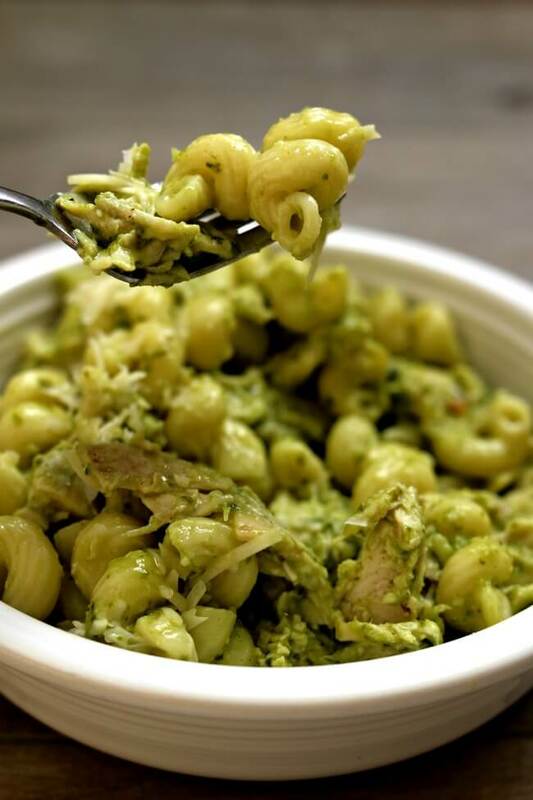 Stir the chicken and pasta together in the Instant Pot and add in the quarter cup drained water and the pesto sauce. Coat the chicken and pasta with the sauce. Scoop onto serving dishes and enjoy! 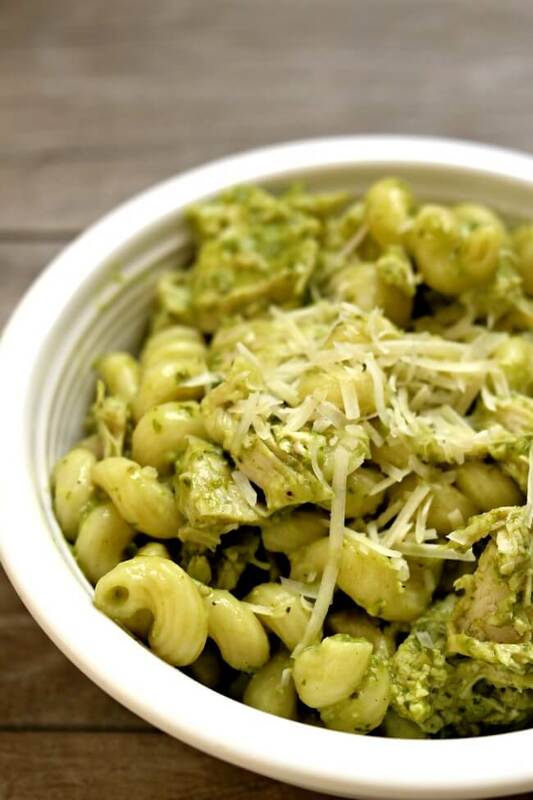 Like this recipe for Easy Instant Pot Chicken Pesto Pasta? Get all my new recipes delivered to your email inbox by signing up below. Yes I bet the fact that was quinoa brown rice was the reason it didn’t turn out. I haven’t tried that brand myself yet but it sounds interesting. Did you use a lid on the pasta pot? Could I make this without the extra pan? I usually use fresh chicken and put it together in the main pot with the pasta. Will that work for this frozen chicken recipe or is the extra inner pan a must? You could. I would cut the chicken into bite size pieces so that it will cook at the same rate as the pasta. Do you use water or broth when cooking all in one pot? Hello there!! I got My very 1st electric Pressure(Gourmia) cooker in the Mail today… And I’d like to try out this recipe… But I’m not completely understanding how you separate the Pasta from the Chicken at the same time..? Also how/when do you add the Pesto sauce..? Thanks in advance! 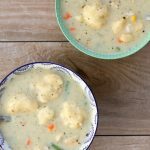 This recipe uses the pot in pot method. This means that there is a smaller pan/pot inside the instant pot. You will put the chicken inside the instant pot and then put the pan that fits inside your instant pot (I used this one: https://amzn.to/2SyrKeG) on top of the chicken with the pasta and water inside. The pesto sauce is stirred in after the chicken and pasta are cooked. As ever, your recipes are easy,innovative and yummy!! If I make the Chicken without the pasta, should I change the cooking time? I know that decreases the beauty of recipe but I have another grain lined up for the meal. Without the pasta, can I double the chicken and then add a bit of buttermilk or half and half at the end? I would keep the cooking time the same. Yes you can double the chicken and add half and half. That would be so tasty! Karen I have been using your recipes and just love them! I don’t have an Insta pot just a slow cooker. I need to make 1.5x or double this recipe. Will that fit in the pot? Change the cook time? Same cook time and yes it will fit in the pot as long as you have a dish big enough for the pasta. 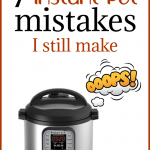 I joined this site for slow cooker recipes, although an Instant Pot is a type of slow cooker, I am disabled and can’t afford the money for anything that nice to cook with. Have I joined the wrong site or how should I change it to benefit me and still make your great recipes??? are you on my email list Cheryl? 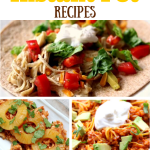 I can put you a list for only slow cooker recipes. How would you adapt this for the slow cooker? Sounds delicious! You could easily make this on the stove. Cook the chicken and cook the pasta and stir in the pesto sauce. Easy! Crockpot don’t do great with pasta.